The name “taxi” is obviously shortened from “taxicab”, which is derived from the two words: “taximeter” and “cabriolet”. The taximeter was invented in 1891 and is used to record distances and calculate the fare. Cabriolet refers to a horse drawn carriage where the driver stands in the back of the carriage. The name “taximeter” itself is derived from the Mid-Latin “taxa”, meaning “tax or charge”. The first documented use of the word “taxicab” was in March of 1907 in London. 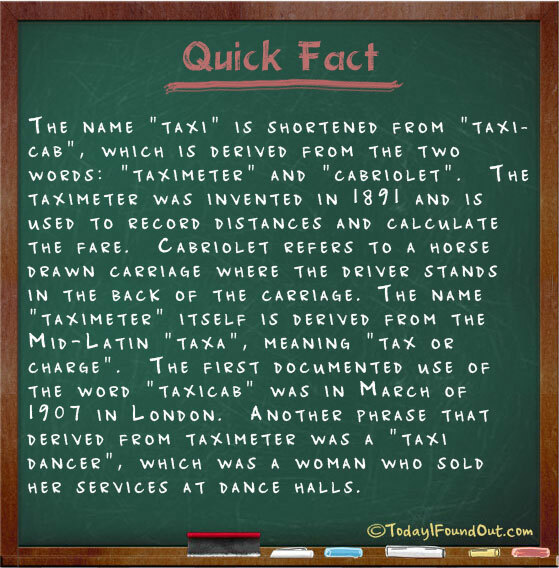 Another phrase that derived from taximeter was a “taxi dancer”, which was a woman who sold her services at dance halls. The Greek word “taxis” can convey the idea of “sequence” or “order”, i.e. “I went from point A to point B, and on to point C”. Hence, it was properly applied to the “taxi” as a transport vehicle.